This tasty, easy, homemade banana bread pudding is a satisfying Southern classic baked from scratch! 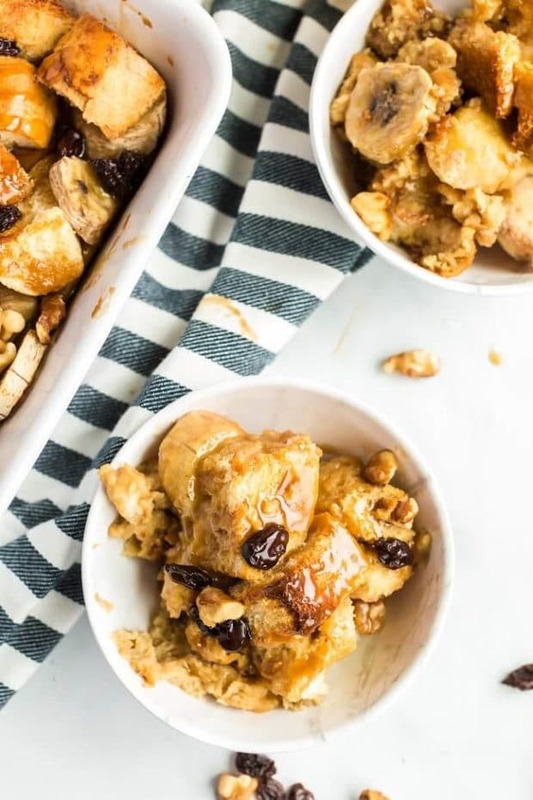 This amazing recipe for banana bread pudding uses delicious fresh ingredients for a quick, simple and filling treat. Baked from scratch, this homemade Southern classic has lots of potential variations as well. 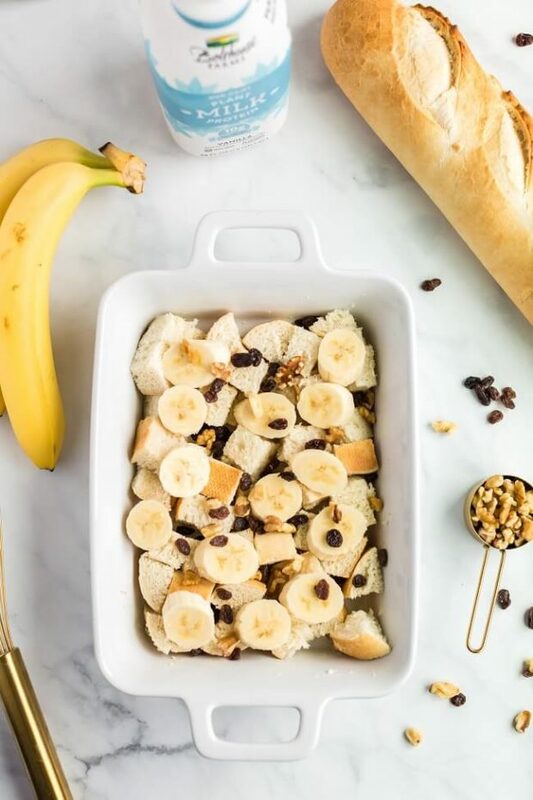 You can bake this easy recipe with raisins, chocolate chips, caramel, Nutella, vanilla pudding or bananas foster sauce. For the bread, you could use French bread, brioche bread or with croissants. or even squares of banana nut bread. I think the award-winning flavor is best when served still warm out of the oven and topped with whipped cream.I think you’ll quickly agree, this banana bread pudding is tasty! Delicious food is a big deal in our family. We love cooking and eating as a group. We often head to the kitchen to do some baking together — after all, everyone likes to be involved when creating a tasty, homemade recipe. The banana bread pudding I’m sharing with you today is a new favorite for us. It’s so quick and simple to bake and the flavor is award-winning! What is Banana Bread Pudding? Bread pudding is a bread-based dessert that is made of bread, milk, eggs, butter and a variety of fillings. In short, this Southern favorite is heaven on your taste buds. Our version includes bananas baked in, giving this old-fashioned classic a whole new level of flavors. What Bread to Use in Banana Bread Pudding? Typically, people use a day old loaf when making bread pudding. Supposedly, the moisture leaving the bread means it soaks up the other ingredients better. I don’t worry about this theory too much and actually, use fresh bread. For this recipe, I used French bread. You could also with brioche, banana nut bread or croissants. High-quality ingredients make a world of difference when you’re creating a delicious recipe. I’m using the best in this banana bread pudding. 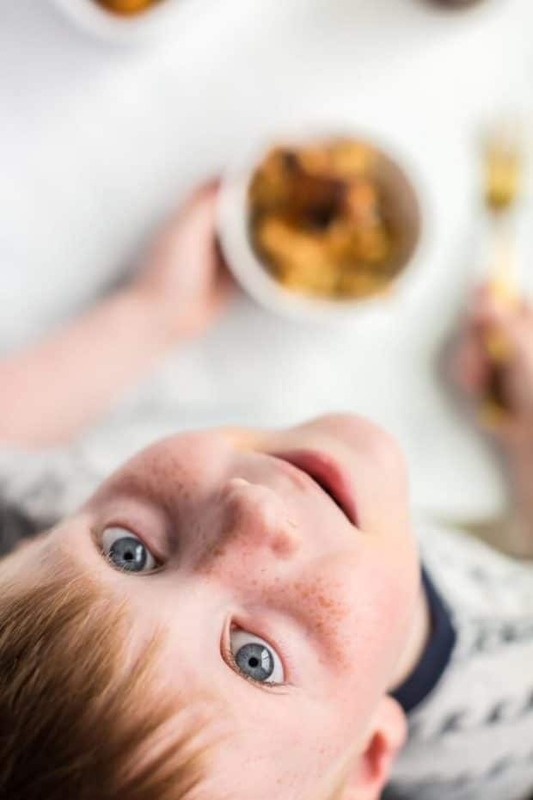 Did you know that Bolthouse Farms® now offers plant protein milk? It’s yummy! You’ll find it at Kroger in the refrigerated milk aisle during your next shopping trip. It’s in the refrigerated milk aisle. It comes in four tasty flavors: Original, Vanilla, Unsweetened or Chocolate. Why do we love it? Because Bolthouse Farms Plant Protein Milk is a dairy-free plant-based milk that contains 10 grams of pea protein per serving. To put this in perspective, almond milk only has 1 gram of protein per serving. As someone who needs a lot of protein, this is fantastic news. 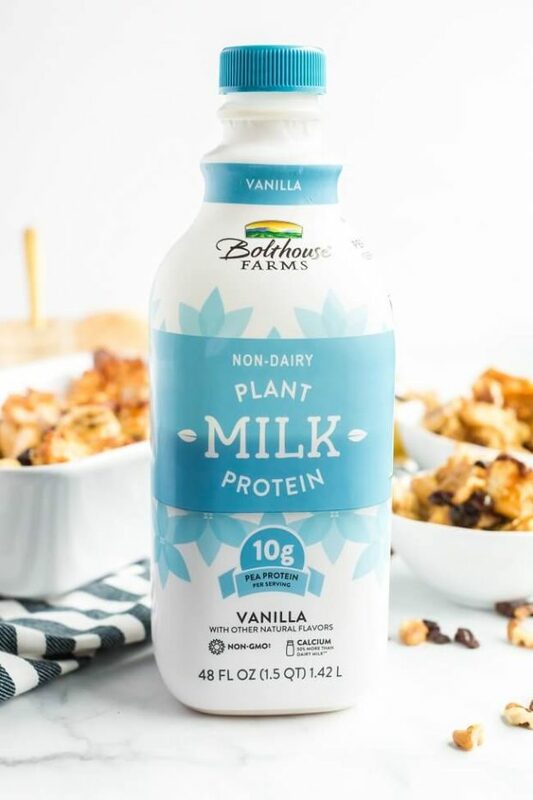 Bolthouse Farms Plant Protein Milk is non-GMO, soy free and has 50% more calcium than dairy milk. It’s an amazing star of the show in this healthy recipe! A tall, cold glass is also delicious when served alongside this warmed, baked goodness. This easy recipe comes together in only 10 minutes, making it a great option for busy days or last-minute guests. Start by coating the bottom of a 3-quart (8 ½ x 11 ½) baking pan with butter. You could also use a 9×13 casserole dish for this recipe. If you do that, you’ll want to decrease baking time by 10-15 minutes. Next, slice the bread into thick slices and cut each slice into six pieces. Then, layer half the bread in an even layer on the bottom of the baking pan. Now, you’ll cut up one banana and place the slices over the top of the bread. Then sprinkle with half the walnuts and raisins. If you don’t like raisins, you can omit them from the recipe. Some folks like pecans more too so that’s another variation option. Once that step is done, you’ll layer the rest of the bread on top. Slice the second banana and place on top. 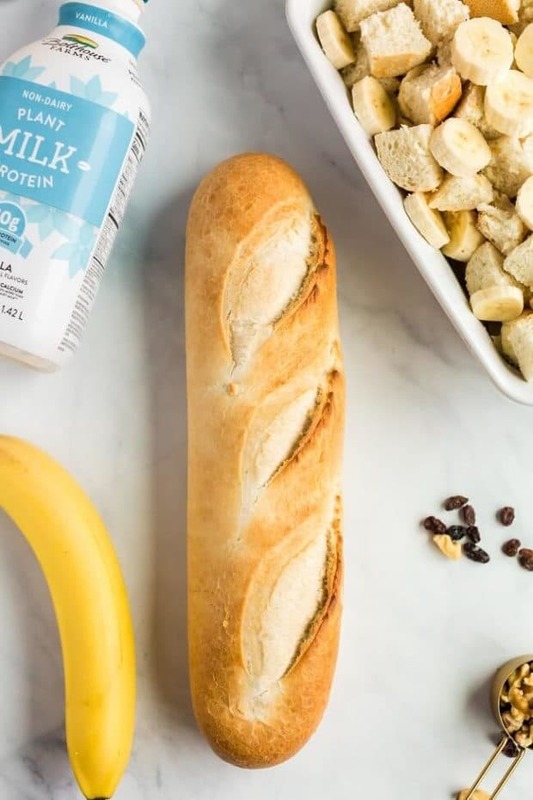 With your bread assembled, you’ll grab a large bowl and whisk together eggs, brown sugar, and Bolthouse Farms® Vanilla Plant Protein Milk. Pour the custard over the top of the bread and then sprinkle everything with the remaining walnuts and raisins. Bake at 350 degrees for 25-30 minutes, then cover with foil or parchment paper and bake for a remaining 20 minutes. Remember to reduce this baking time if you used a 9×13 pan. 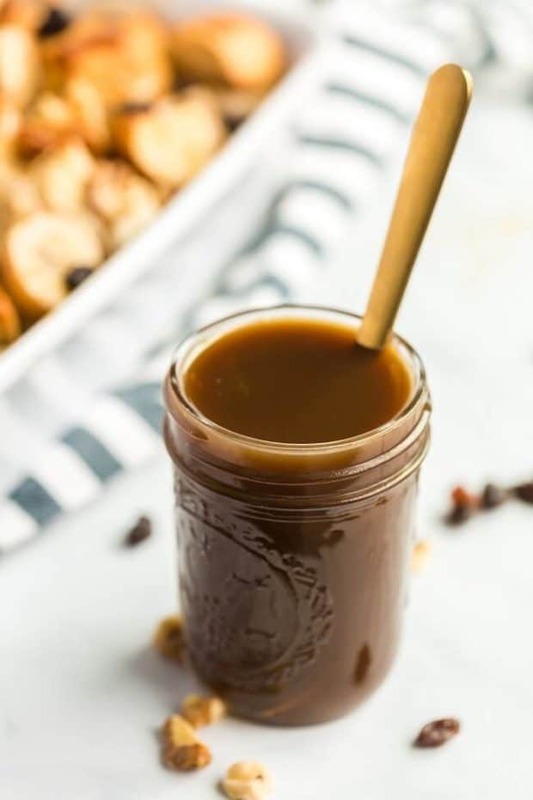 While the bread pudding is baking, you can make the caramel sauce. Melt half a cup of butter in a saucepan over medium-high heat. Pour in sugar and stir until melted. Let this mixture simmer for 1-2 minutes, stirring occasionally. 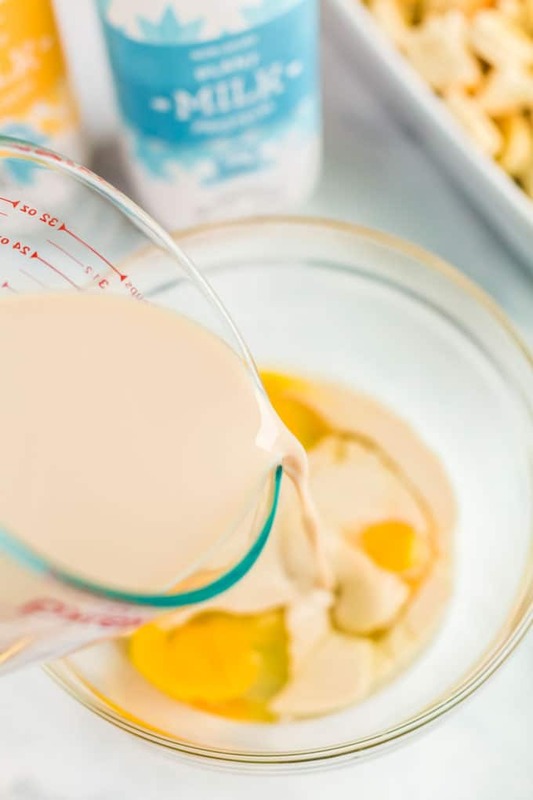 Remove from the heat and stir in vanilla and Bolthouse Farms® Vanilla Plant Protein Milk. 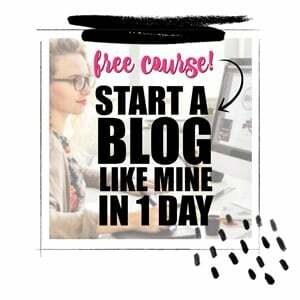 Finally, pour into a heat-proof jar. 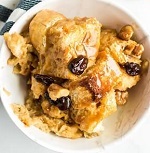 Once the bread pudding is done baking, remove from the oven and drizzle with the homemade caramel sauce. Let sit for 5-10 minutes and then slice to serve. You can add additional caramel sauce if you’d like! You can enjoy this as a dessert or as part of a brunch menu, which we love. It’s perfect served as a breakfast with eggs and meat. The sweet from the banana bread pudding is the perfect compliment to other savory breakfast items. If you’re serving for dessert, it’s divine served warm with a big dollop of fresh whipped cream on top. A little extra of the caramel sauce on top is perfection. I’d also suggest a cold glass of delicious and refreshing Bolthouse Farms® Vanilla Plant Protein Milk when serving. I’m confident your family and friends will enjoy this tasty, homemade banana bread pudding baked from scratch just as much as we do! Slice the bread into inch thick slices and then cut each slice into six pieces. Layer half of the bread in an even layer on the bottom of the baking pan. Cut up one banana and place the slices over the top. Sprinkle with half the walnuts and raisins. Layer the rest of the bread on top. Slice the second banana and place on top. In a large bowl whisk together eggs, brown sugar and milk. Pour the custard over the top of the bread and sprinkle with remaining walnuts and raisins. Bake at 350 for 25-30 minutes, then cover with foil or parchment paper and bake for a remaining 20 minutes. To make the caramel sauce, melt half a cup of butter in a sauce pan over medium high heat. Pour in sugar and stir until melted. Let the mixture simmer for 1-2 minutes, stirring occasionally. Remove from the heat and stir in milk and vanilla. Pour into a heat proof jar. When the bread pudding is done, remove from the oven and drizzle with the caramel sauce. Let sit for 5-10 minutes and serve. Add additional caramel sauce if desired. If using 9x13, reduce baking time by 10-15 minutes. 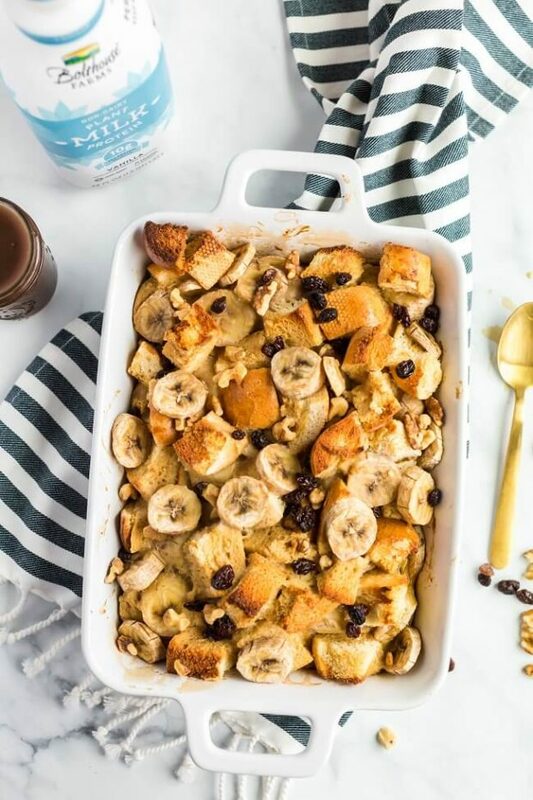 Yum, we love this delicious bread pudding for brunch!